This evening, for the first time, I have actually opened a bottle of sylvaner. And, you know what? It’s really good. Just like every other bottle of sylvaner I’ve ever tried – about half a dozen – has been really good. This is a grape which deserves to grace my table on a more than once-a-decade basis. Sure, it’s better known for producing character-free alcohol-water than quality wine, but is that reason enough for its obscurity? After all, it’s hardly harmed pinot grigio, has it? Jancis Robinson is about to publish her guide to every grape variety she and her grape-loving chums could identify – 1,368 of the little blighters – yet even a promiscuous drinker in a country with perhaps the most open, acquisitive wine trade of them all gets largely stuck on the same dozen or so. Without actually having anything as advanced as a genuine statistic, I’d be willing to wager that two dozen grape varieties are responsible for 98% or more of Britain’s vinous intake. However much pleasure and variety that small selection provides, how much more could the remaining 1,344 contribute? Before tonight, my limited experience of sylvaner has all come in a brief visit to the maverick Reinhessen sylvaner obsessive Michael Teschke (a revelation, and impressive enough for me to bring home a couple of bottles, still unopened, of his older wines – that’s right, this wine can age). This is a man memorable primarily not for growing and loving the really quite obscure blue sylvaner (a grape whose main benefit is that it reminds me of an often-forgotten Erasure hit, though it must be said that I drink it even less often than I do not-blue sylvaner, which is to say, never), nor even for pulling off a middle-aged male ponytale, but for wearing sandals even in winter because “feet need to breathe”. There’ll be more about him at some point, when I actually open his wines. In the meantime, back to tonight. Here are some more numbers: out of 3,176 wines listed at the moment on The Wine Society website, two are 100% sylvaners, one costing £7.50 and the other £7.95 (this one came from them, part of a mystery mixed case – which is a wine merchant’s way of saying that nobody wanted to buy it when they knew what it was). Berry Brothers sell 5,615 wines and again just two are sylvaners, and one of those is being sold en primeur so you can’t actually have it. Slurp’s 4,215-strong list contains one, and winedirect has precisely that number among their 7,360 offerings. It’s not just me who isn’t giving this grape very much attention. We’re all missing out. It may be that it takes an exceptional producer to make a truly memorably sylvaner, but that might either be the cause of the grape’s obscurity, or the symptom (in other words, if we bought more of it, perhaps more producers would put more effort into making it taste good). But on the plus side, even the good stuff is cheap: sylvaner even from classy producers who take it seriously, such as Bruno Sorg and Domaine Ostertag in Alsace, costs little more than a tenner a bottle. This one is from an area less well-known for making this less well-known grape: the Alto Adige, in Italy but close enough to Austria for German to be their first language. Köfererhof have just five hectares of vines, which are cultivated organically (don’t ask Teschke what he thinks about that, incidentally). At six years old it has a deep golden colour and gentle acidity, and whispers softly of grapefruit and green mango. Scrummy, and what’s more Mrs CF agrees. 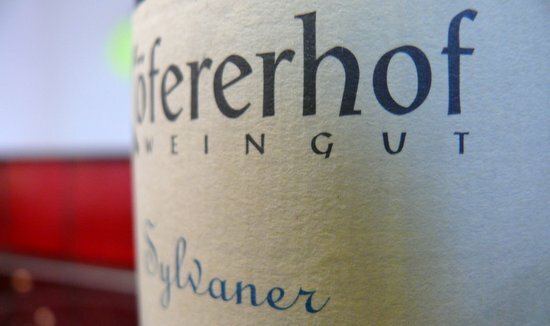 Sadly winesearcher suggests that nobody is selling Köfererhof’s wines in the UK any more, but I’m already working on an Alsatian order – It seems I’m just a sucker for sylvaner. I’m sure others would be too, if they ever got a chance to try it.